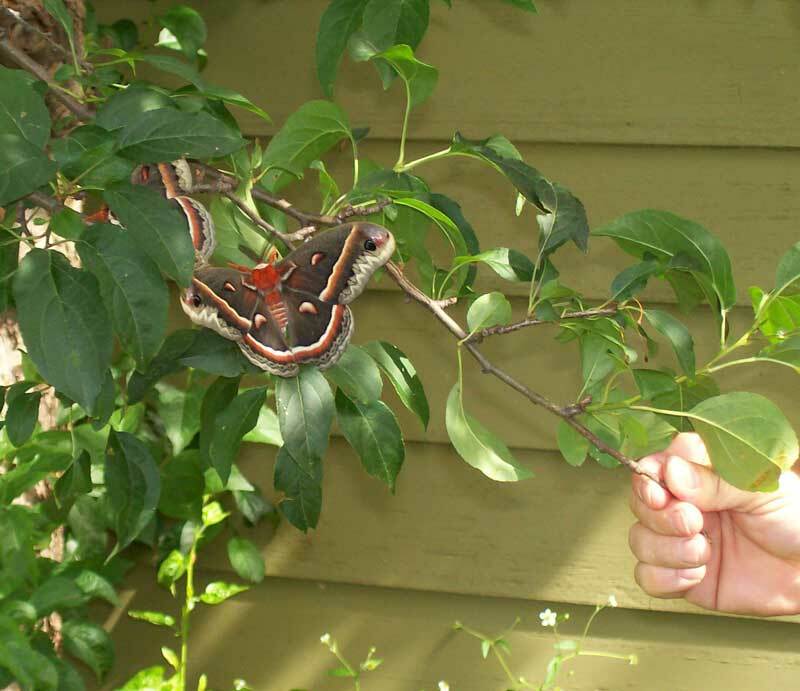 I don't consider myself a moth expert but I have had 10 years of success in raising a few species of 'giant silk worms' and in the process I have learned a great deal about these particular moths. Cecropia (Hyalophora cecropia) is my favorite. Followed closely by the Promethia (Callosamia promethea), the female of which looks very much like the cecropia except much smaller. The male is the same size as the female but much darker in color (looks nearly black when flying). I'm not a big fan of the Polyphemus (Antheraea polyphemus) mainly because it is too much in a hurry to do everything (it can actually emerge twice in one year) and the caterpillars give me the heebie jeebies. Before raising these moths I had only seen one in my life (and now I 'see' them every year). They are amazing creatures and they do very little damage. My segment on Wisconsin Public Television; "Wisconsin Gardner" is intended to demonstrate this to people so that if they see these caterpillars on their trees they will recognize what they are -- and what they will become -- and therefore leave them alone. It is a beautiful moth and the larvae (caterpillar) is impressive (beautiful in it's own way.) Both little kids and adults seem to get a kick our of raising these moths and I furnish eggs each year to anyone who asks (while supplies last). Another reason I raise them is because these moths are native to our area and are they on the decline. The decline is partially due to biological control of the gypsy moth. Many of the techniques people use to kill the gypsy moth (an imported pest) also kill the Cecropia and it's relatives. 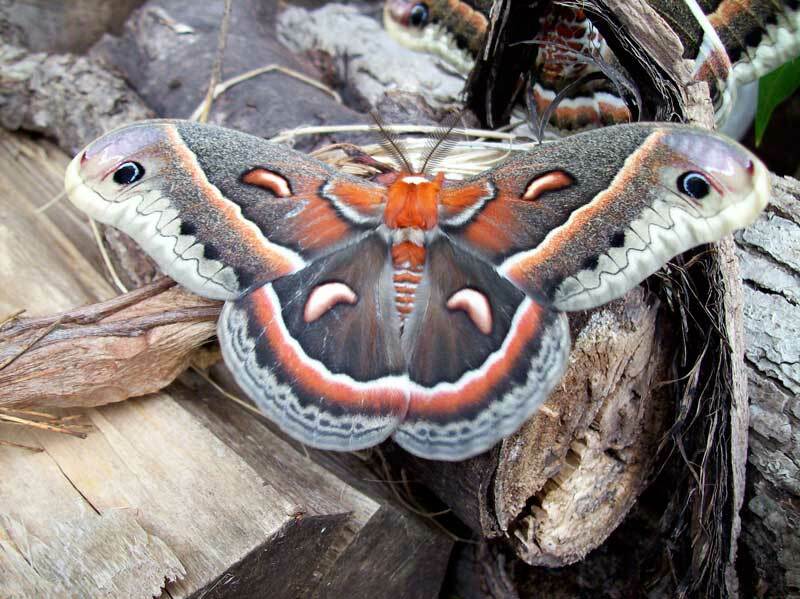 The worst of these is a small fly which was imported from Europe to kill the gypsy moth but is also killing huge numbers of other moths - Cecropia included. Raising these moths is easy. They emerge from their cocoons in June each year. The moths don't have any mouths so they can't eat. Their only purpose is to fly around - looking beautiful - to find a mate. After mating, the female flies around and lays a total of about 100 eggs and then she dies. Within a week the eggs hatch and the caterpillars start munching on tree leaves. They will grow through 4 stages to be as large as your finger. In early september they spin their cocoon where they spend the winter. The following June they emerge as moths and the cycle repeats. I started raising the larvae (caterpillars) in a small aquarium in our living room. I'd put twigs in a bottle of water (to keep the leaves fresh while the larvae ate). When they had all the leaves eaten I'd bring in a new branch. The main reason for the aquarium was to catch the 'poop' since the larvae don't try to get away - until it's time to spin their cocoon. When they are done eating they start searching for a good place to spin. One day my wife was reading the newspaper at the table when 'plop' a large larva landed on the paper and that was the end of raising larvae in the house. Now I just put them right on the tree branch. 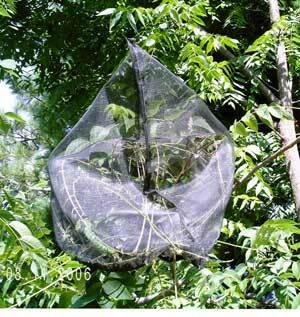 I enclose the branch with a bag made of ordinary nylon window screen closed at the top with a piece of string or wire. This protects the growing larvae from predators and keeps them where I can keep an eye on them while they grow. 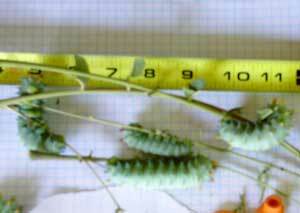 After they spin up their cocoon I cut off the twig and put in in my un-heated garage over winter. In the spring I move the cocoons to my deck so they will synchronize with nature. The females use pheromones to attract mates and males will be drawn from miles around. There have been years when I've seen to a dozen male cecropia fluttering around the deck trying to get at one female. I usually just keep one female and her eggs and let the rest fly away when they're ready. I save a few eggs for raising and give the rest away. These go mostly to friends and associates at work who have kids who want to try raising moths. Some go to teachers for use in their classrooms. And one year I gave over a hundred eggs to a student at UW Entomology Department who was doing research on survival on trees in northern Wisconsin. 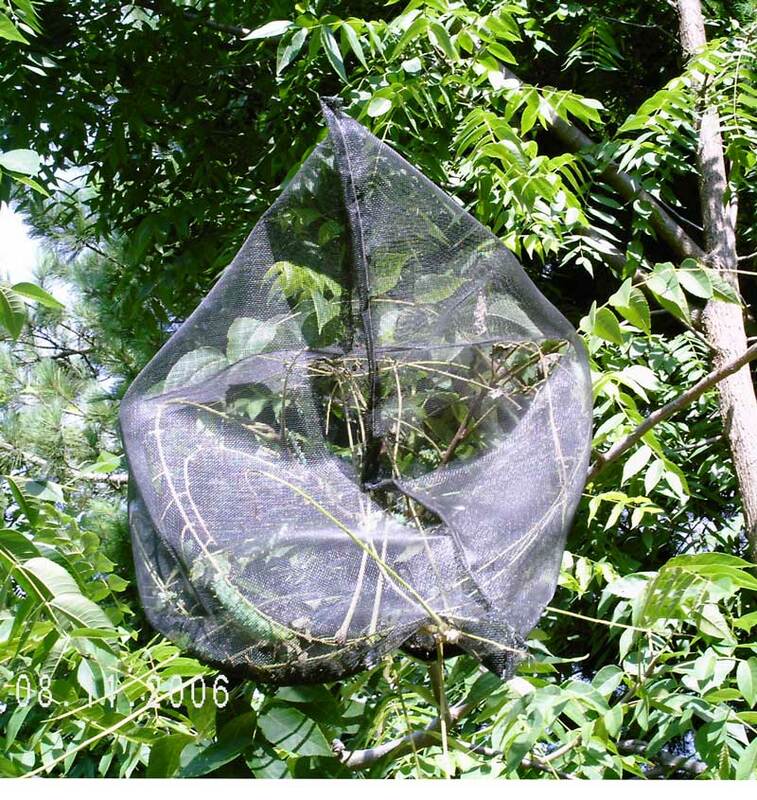 One year I got a request (from my web site) for the spent cocoons from a researcher in textile industry who is looking at qualities of the silk produced by native silk worms.